Electric is a kind of effect in the Super Smash Bros. series that debuted in Super Smash Bros.. Targets hit by electric attacks will be shocked and spark for a second or two. The electric effect is distinct from the paralyze effect, despite most attacks with the paralyze effect using electrical sound effects. 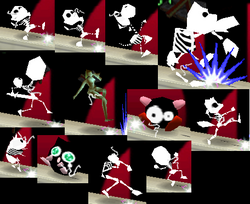 In Super Smash Bros. only, characters hit by electric attacks briefly flash black, with their skeleton visible (except Samus, whose suitless shape is seen instead). In Super Smash Bros., Melee, and Brawl, electric attacks always emit very loud sounds on hit. Starting in Smash 4, this has been toned down to a quieter "buzzing" sound. They multiply the freeze frames of an attack by 1.5x. Prior to Brawl, this multiplier only applied to the victim, not the attacker. In Smash 4, they cause attacks to inflict one more frame of hitstun than usual. They do no damage to Yellow Pikmin, which will not flinch. They make Hotheads grow larger and make them more powerful. Electric attacks are boosted by Electric Attack stickers in Super Smash Bros. Brawl's The Subspace Emissary and the Spirit skill or trait Electric Attack ↑ as well as certain Spirit Battle conditions in Super Smash Bros. Ultimate. Electric attacks are resisted by Electric Resist stickers in Super Smash Bros. Brawl and the Support Spirit skills Electric Resist ↑ in Super Smash Bros. Ultimate. These attacks also deal more damage to fighters equipped with a Primary Spirit with the trait Electric Weakness. The majority of magic, energy, and PK attacks use the electric effect, though this is hardly universal. In addition to natural stage hazards, the Spirit Battle condition "The floor is electrified" creates a hazard that inflicts electric damage. 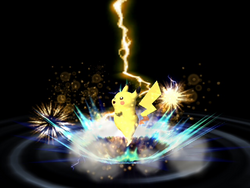 In Melee, when Pikachu uses its back, up, or down throw on an opponent, it begins to spark immediately, without the "shock" being displayed when the move connects. This was fixed in Brawl, where they were given a neutral effect. This also happens to Pichu, with these attacks also being the only ones that don't cause recoil damage to it (besides dismissed Thunder). In Brawl and Smash 4, characters use a special animation when hit by an electric attack, which has them continuously tremble in place during freeze frames and before being launched, instead of using a single animation frame, and is the same as their animation when paralyzed. When a character is hit by an electric attack in Brawl and they have high enough damage, the crowd doesn't make any sounds unless the electric attack in question happens to hit an opponent that has already been launched by another, non-electric attack. Introduced in Super Smash Bros. This page was last edited on April 20, 2019, at 01:01.